Gritter driver Kevin Ryan was lucky to escape more serious injury when his truck crashed off the road in bad weather. He had gritted a hill in Cornhill when the vehicle skidded into a tree which smashed the windscreen and the side cab window and hit him on the head. Fire crews were called and considered cutting the roof off the truck to get him out but the steering wheel was eventually moved out of the way and they were able to remove him. Kevin was then taken by ambulance to Borders General Hospital where he was treated for whiplash injuries and cuts and bruises. He was also given a CT scan but received the all clear and is now making a steady recovery at home in Tweedmouth. 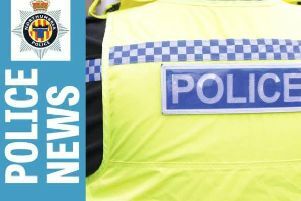 The crash happened on Sunday, January 21, on the B6350 close to the junction of the A698 opposite the Collingwood Arms Hotel. Kevin, who works for Northumberland County Council, had been out gritting from 3am until 8.30am before going to wash the truck down and head home but he was then called back out to the Cornhill area to help out. When he crashed, passer-by Mike Turnbull found Kevin and called for help. Co-worker Andrew Deans then arrived at the scene and managed to move the steering wheel so Kevin could be removed. She also praised the council for the support Kevin has received since the crash. Last week, the county council’s gritting teams were praised by the authority for their work during the recent white-outs.